“Minister Aryeh Deri has welcomed Donald Trump’s election for what he said he believed would be the blow it will strike to Reform and Conservative control of the US government and against progressive Jewish influence in Israel. Deri made his comments during an address to the local religious council of Ashdod on Thursday. “There is no doubt that one can give thanks to God that all those who have damned the [Jewish] covenant and all those who would wipe out Judaism who thought they could take control here over the Land of Israel and lead all these reforms in order to destroy received their blow,” said the minister. What in the world does Donald J. Trump or anyone who voted for him have to do with Conservative and Reform Judaism? It doesn’t have to be said that Donald Trump has absolutely nothing to do with the Reform and Conservative movements. There is absolutely no relationship at all between those movements and Donald Trump. Donald Trump cares about liberal Jewish movements as much as he cares about the right of gender fluid people to be addressed with gender neutral pronouns. So what is Deri talking about? How does this make any sense, even to himself? What he’s doing is essentially what every single other person truly emotionally invested in this past election is doing. He’s just translating Trump’s empty political talk into his own language. Politicians don’t say anything that means anything. All they do is use meaningless catchphrases that talk about good and evil but are devoid of any actual content on what constitutes those two things. In Deri’s head, the evil people are Conservative and Reform Jews who are trying to destroy Judaism because they hate God, and it is the #1 priority of God Himself to stop them, obviously. They are the cause of all bad in the world, so of course Trump is talking about them when he talks about bad things. When people hear politicians talking emotionally about good and bad things but lacking any content, they fill in the content with what they believe are good and bad things. It becomes a religion. You take what you hate and you pin everything bad in the world on whatever that thing is, while the empty rhetoric of whatever politician fuels it but you fill in the blanks. Whether it’s gays or Reform Jews or the “Establishment” or Evangelicals or environmentalists or global warming or climate-change-or-whatever-they-call-it-now skeptics or deniers or whatever, it makes no difference. Just as anti Semites say the Jews control the government, or the Evangelicals say the God-hating abortion-loving atheists control the government, Deri says the Conservative and Reform movements control the government. It’s all the same complete nonsense. So why is it so particularly bad this election cycle and why do I believe this is the last one for the country before it breaks apart? Because there is a sense of an ending among many. There’s an innate sense among Americans that something is very wrong. They don’t know what it is but they know it’s getting worse. 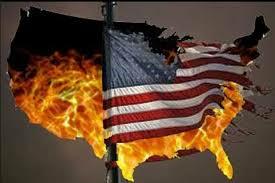 Most people can sense in their subconscious that America is at a breaking point. So that just makes people hate the people they pin their irrational hate on and love the people they pin their irrational love on. It’s why those who love Hillary so much, hate Trump so much that they’ll blab on about how his “hate for women” will be the end of the country. It’s why so called “minorities” are acting so afraid for their lives even though Trump is not going to kill “minorities”, a term which really has no meaning anymore because anyone can self-identify as whatever race they feel that they are. It’s an absurdity wrapped in two more absurdities. Nothing changed. All that happened was just an exchange. But somewhere deep down, people know that this is it. What will happen is that the debt bubble will collapse during Trump’s first term. He’ll be blamed and there may even be a civil war as the massive welfare warfare state finally buckles and Trump can do nothing about it. Everyone is losing their minds in this election because they feel that the situation is at a breaking point, but they don’t even know what the situation is. So they take the targets they’ve been trained to hate and the targets they’ve been trained to love and they pin extreme emotions on these targets and personify it in a politician who spouts emotional language lacking any content which they then fill with their own beliefs and emotions, none of which have anything to do with the real actual reason why the country is about to fall. Deri, being a particularly dimwitted moron, comes in and gives his own answer as to what he hates versus what he loves and says the election is really about THAT. But obviously it’s not. And it’s not about what anyone else is saying either. Deri hates Conservative and Reform Jews, and he loves “god” whatever he thinks that is. That the content that he fills the empty rhetoric with. I suppose his imaginary version of Olam Haba is him surrounded by Conservative and Reform Jewish leaders impaled on stakes or something. His total unrelated conception betrays how everyone’s conception of this election has nothing to do with anything that actually matters. Everyone is simply projecting their own programmed fears and desires onto these two candidates, none of which are relevant to anything at all. It’s all imaginary conceptual barf. When the debt bubble pops, the lefties will blame it on Trump’s “intolerance of women and gays and blah blah” and the righties will blame it on the fact that we didn’t bomb enough countries and kill enough people and it’s the Muslims’ fault blah blah blah. But it always just comes down to money. The country is going to fall simply because it borrowed too much money to hand out to people who wanted handouts and more wars, and now its people have to pay the debt back by consuming much much less, meaning people will have much much less stuff and standards of living will plummet. Lots of fighting ahead. Ugly will it get. The hystericals are right. The country is going down. But none of them know why. It’s like everyone is acting out their own personal nightmares and wet dreams. While you’re in the dream it makes sense, it’s either terrifying or awesome, but when you wake up you realize nothing about it made any sense at all. This election was nothing but a joint wet-dream-nightmare shared by all americans who are all sleeping while their house is burning down, and they have yet to wake up. They smell the smoke but they’re filtering it all through their own versions of the wet-dream-nightmare they are all currently stuck in. Deri is a no-good-nik, but in this instance, cut the guy a little slack. What does he know about the makeup of American Jewry? Think about odious tools like Dennis Ross, Richard Haass, and Daniel Kurtzer, among others. American (non-observant, which to Deri probably means “Reform”) Jews who have been pushing an evil agenda in US politics for decades across party lines. Vote for Bush, Clinton, Bush (again), or Obama. It didn’t matter. These jerks were a regular presence in every administration. Or consider NeverTrump neocons like William Kristol. They are toast. They are gone. This is a good thing.